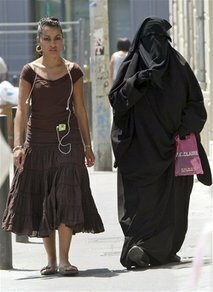 PARIS—President Nicolas Sarkozy said the Muslim burqa would not be welcome in France, calling the full-body religious gown a sign of the “debasement” of women. On the one hand, it is an acknowledgment that some cultural practices don’t belong in the West and puts Sarko to the right of any American politician. On the other hand, this is coming from a guy who said that miscegenation was a duty and is still missing a focus on the most fundamental basis of identity which is race. I wonder if the government could charge itself with hate speech. Is this a positive development or a neocon distraction? We know that Sarko’s positions include not only racial blending, which you mention, but the merger of Europe and the Muslim world. But given that he’s so awful, can’t we say that it’s good that we get at least something good out of his presidency, without letting ourselves believe that this one step represents an overall positive trend? Of course, the neocons will do precisely that. They’ll say, “Sarkozy is a great conservative leader! He’s speaking up against the burqa!”, while they go on ignoring, or actively approving, everything else Sarko is doing to bring about the Islamization of Europe. Here is one good thing that Sarkozy is doing, and other Western countries should follow his lead. But let’s not think that this represents some kind of solution to the Islam threat, because Sarkozy supports a Mediterranean Union joining Islam and Europe, he supports the effective inclusion of Turkey in the borderless EU, and he affirmatively advocates racial mixing as society’s ideal. Seen in their entirety, his policies lead to the Islamization of Europe and the elimination of the white race. Sarko is, in short, not any kind of conservative, but a liberal and a dhimmi. Also, this step, welcome as it is, is very limited. He is only condemning the full body covering. Everything short of that he approves. His hostility to one particular Islamic manifestation should not lead us to forget his overall embrace of the religion that spells our subjugation and doom. Thus the reason Sarkozy gives for rejecting the burqa is that it represents the “debasement” and “subordination” of women. Which shows that he’s not concerned with protecting France from Muslims, but with protecting the rights of Muslim women in France. Besides which, his “debasement” remark is liberal fantasy. If Muslim women living in a free Western country are wearing the burqa, it is, in the overwhelming majority of cases, because they choose to do it, as a bold assertion of Islam, not as a mark of their supposed subordination to Islam. And this leads us to the real significance that the wearing of the burqa in Western societies has for us: not the subordination of Muslim women, but the invasion and takeover of the West by a totally alien and hostile religion. Naive conservatives are of course excited at Sarkozy’s hard-line position on the burqa, because they think it will make Islam more assimilable and less dangerous. In reality, if the burqa is prohibited, and if we, our fears quieted, allow a de-burqa-ized, less scary-looking Islam to gain power in our societies, Islam, once it has gained power, will bring back the burqa as well. What we need to say, then, is not just that the burqa is not welcome in the West, but that Islam is not welcome in the West. In the first presidential address to parliament in 136 years, Sarkozy faced critics who fear the burqa issue could stigmatize France’s Muslims and said he supported banning the garment from being worn in public. “In our country, we cannot accept that women be prisoners behind a screen, cut off from all social life, deprived of all identity,” Sarkozy said to extended applause at the Chateau of Versailles, southwest of Paris. Dozens of legislators have called for creating a commission to study a possible ban in France, where there is a small but growing trend of wearing the full-body garment despite a 2004 law forbidding it from being worn in public schools. France has Western Europe’s largest Muslim population, an estimated 5 million people, and the 2004 law sparked fierce debate both at home and abroad. Even the French government has been divided over the issue, with Immigration Minister Eric Besson saying a full ban would only “create tensions,” while junior minister for human rights Rama Yade said she was open to a ban if it was aimed at protecting women forced to wear the burqa. The terms “burqa” and “niqab” often are used interchangeably in France. The former refers to a full-body covering worn largely in Afghanistan with only a mesh screen over the eyes, whereas the latter is a full-body veil, often in black, with slits for the eyes. A leading French Muslim group, the French Council for the Muslim Religion, has warned against studying the burqa, saying it would “stigmatize” Muslims. Sarkozy was due to host a state dinner Monday with Sheik Hamad Bin Jassem Al Thani of Qatar, where women wear Islamic head coverings in public—whether while shopping or driving cars. Good point about the feminist justification for the burqa ban. My theory is that the disagreement between modern liberals and conservatives like Sarkozy is how they balance hatred of the West and feminism/gay rights. I remember Paul Gottfried writing about Sean Hannity going insane after Ahmadinejad’s famous speech about there being no gays in Iran. His criticism was along the lines of “So international gay rights is now on the conservative agenda?” It’s the same thing you get from Bush’s defense of the Iraq war where he calls people who don’t think Arabs need or want democracy racists. So Fox News and Bush are consistent in their application of universal liberalism, while leftists hate the West so much that they will always take the side of non-whites and chuck their PC instincts when needed. The PC idiots I meet at the university would never dare criticize how Muslims treat women and will call anyone who does “racist.” They even use it to describe Sarkozy. As far as the French president’s stance on miscegenation, at first thought this seems to put him farther to the left than any American politician. When combined with his wanting a burqa ban putting him to the right of any American politician, there seems to be a conundrum. However, thinking further about the topic shows that this doesn’t fit him any particular place on the political spectrum because everybody has the same stance on race mixing. Coming out in favor of it just makes him the most explicit politician there is. It’s like if he would’ve came out against animal cruelty. His position is so accepted that there’s no ideological component to it at all in modern discourse. If anything, it’s another instance of modern conservatives being more consistent than liberals and wanting to do away with all distinctions. You are right. The “conservatives,” i.e., the right-liberals, believe more in the universal equality of all individuals, while the left-liberals believe in approving and opening ourselves to all cultures, no matter how alien and hostile they may be. But the distinction is in the long run illusory, because the “conservatives” open the doors to what they think is the universal individual, but in doing so, open the doors to alien and hostile cultures. At the same time, it is true that in the respect you mention, the “conservatives” are more liberal, i.e., more anti-discrimination, than the left-liberals. The left support social controls for the sake of the good of society, and so are willing to consider restrictions on Muslim dress that is seen as anti-woman or disruptive in some way. The “conservatives” make the equal freedom of every human on earth their principle, and therefore oppose any restrictions on Muslim dress. As suspect as I am of Sarkozy’s proclamation, we know for certain that Barry al Hussein would never make one, since he declared in Cairo that he would be Islam’s “man in Washington”, protecting the Ummah in Dar al-Harb. Are you sure that Sarkozy meant “burgas” and not “burgers”? He may just be one of those French who think that MacDonald’s is the real menace to French culture, not the adherents of the Religion of Peace. But Sarkozy is always described as pro-American, unlike most French politicians. Sarkozy seems to be following the same micro-policy program with the Burqa. Make a big thing out of being against Burqas while the larger agenda remains in place.